At seven years old, Emmy, Oliver, Caro and Drew are all good friends. But one day after school, Oliver's dad picks him up for the weekend and never brings him back. For ten years, everyone misses Oliver, the police look for him and his dad, his mother is a complete mess, and his friends feel an empty, gaping hole in their lives. And then Oliver comes home. Now seventeen, he's back at the house next door to Emmy, trying to fit in with his family which now includes a step-father and two younger sisters. He's also trying to fit in back at school and with his old friends. To all of them, Oliver has returned home; to Oliver, he has just been kidnapped all over again. Since Oliver has been gone, it's not just his mother who was worried. Emmy's mom is so protective that she doesn't want Emmy to go to college, but instead plans for her to stay at home and attend community college. Emmy learned to surf three years ago and loves it, but knows her parents would never let her be on the surf team so she sneaks around and steals precious hours at the beach, hiding her activities. Emmy actually has a pretty good relationship with her parents, but they clearly want her to live in a protective bubble and she just doesn't know how she'll get out from under their thumbs. When Oliver returned, all the adults admonished the kids to give him space, with the result that Oliver felt ostracized and alone. Finally, Emmy and Drew and Caro started hanging out with him regularly again. Of course they've all changed since ten years ago, but they are getting along very well. 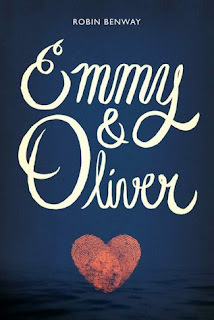 Especially Emmy and Oliver, who quickly become more than friends. But this isn't just another teen romance. Despite the title and cover, it felt much more like it was about friendship. Emmy and Oliver do start dating, but they were friends first and even their romance is based on friendship. Plus, Drew and Caro are huge parts of the story. So if you're turned off by the idea of a teen romance, I would urge you to give it a chance. The storyline about Oliver's abduction is done so very well, in all its subtle complexities. To Oliver, he wasn't a victim of kidnapping, he just moved away with his dad. He knows now that what his dad did was wrong, but for as long as he can remember, that was just his life. Now he has been uprooted and needs to adjust to a whole new life. I felt so bad for this poor kid! He feels so torn and confused. Thank goodness he goes to therapy. There is much to love about this novel, but I found Caro to be especially endearing. She is the youngest of six kids (I am the youngest of five myself) and she is super funny. She shares a bedroom with her older sister Heather and they are opposites in the cleanliness department. Heather is like a tornado and Caro is a complete freak for organization and neatness. I marked several passages just because of her clever quips. Like, when she was commenting on a news anchor whose appearance hasn't changed in decades: "She probably makes so much money that she could hire a team of tiny elves to hide in her hairline and hold her face up." Robin Benway is just full of this kind of clever dialogue. I read Audrey, Wait! several years ago and despite some minor criticisms I really liked it and still recommend it regularly. Although it's tough to pinpoint exactly what makes it so special, Emmy & Oliver is even better - I'm so glad I read another Robin Benway novel. I loved Drew's comments while driving ("The sign says STOP, not GIVE UP! "), though I'd never get in a car with him.